careful, the price on that ebay link is set to over $1000 even though the past items sold for ~$90. even though you see a lot of 'sold' items, be wary. Thanks for info mrbill. Do you have a link to the gear you put together ? @s_maurice - don't use any gh2 parts. The gh3/4 mains unit is the same as they share the same battery. You need to go from your battery source into a voltage regulator (I mounted mine in a small plastic box) then from the regulator into the battery adapter. I have mine set to 8.8v and it works great. 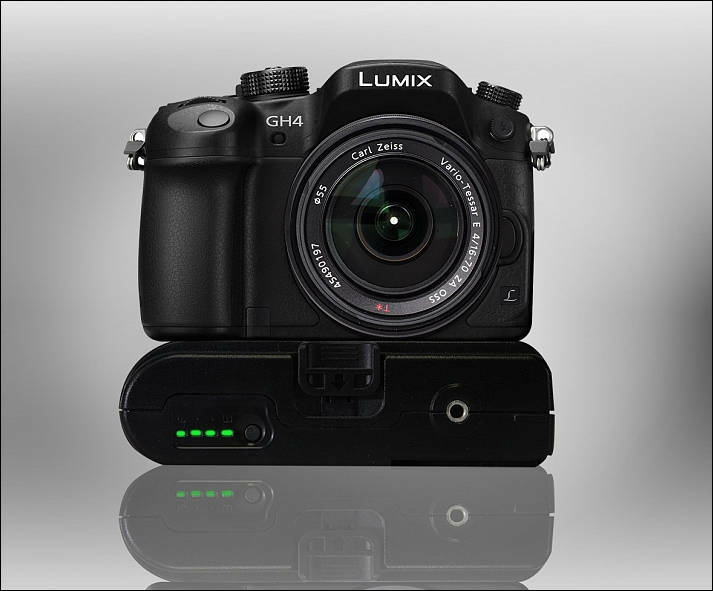 The PB70-GH4 PowerBase-70 Battery Pack is a 77Wh, 14.8V Lithium-ion battery designed to extend HD recording time for the Panasonic GH4. This battery pack comes with a base that accommodates the battery and a battery paddle to insert into the camera. It included GP-DV-GH4 Interchangeable Regulator Block and has a 12" cable. The PowerBase-70 delivers 6 times more power than the original battery supplied with the camera. It is also intended to streamline your recording: the PowerBase-70 mounts under the camera and doubles as a grip, or can be attached to a camera support via its 1/4"-20 release plate or V-mount. Wired as a 14.8V battery pack, it can provide extended power for up to two additional 12VDC devices such as lights, monitors or HD converters as well as other devices requiring lower voltage (an optional XP power regulation cable is needed). The pack is also furnished with 1/4"-20 threads on either side to mount accessories. So I got the voltage regulator in place and is now feeding enough power to my camera. So just wanted to post some photos of how it's currently rigged. Kind of ugly -- wish I had a case... right now it's just held together by electrical tape and velcro. Gotcha. I measured the output of the GH4 battery and it was something in the range of 7.8v. I measured the external battery which I used with the GH2 and it was around 9.0v I guess a bit too high for GH4 (but worked generally well for GH2). I'm going to pick up some voltage regulators off eBay as well to lower the voltage. To be honest, I can't remember - it was a very cheap Chinese voltage regulator board. We just measured the output of the gh4 ac adapter and matched that - it was very close to the output I had for the GH2. I'm using the same 12v battery source as before. @mrbill. I will need to check what voltage my external batteries are outputting. What voltage converter are you using?